After graduating from Washington in 1987, Jeff Jaeger would be drafted in the 3rd round by the Cleveland Browns. He’d play in 10 games his rookie season, hitting 14 of 22 field goals but would lose out in training camp to Matt Bahr in 1988 when the Browns decided to carry only one kicker. Out of football for 88, Jaeger would sign with the Los Angeles Raiders, where he’d play for 7 seasons forming one of the better kicker/ punter combinations in the league with Jeff Gossett. Over that period he’d be named to the Pro Bowl and AP in 1991 hitting 85.3% of his kicks that season, and lead the league in field goal attempts (44) and field goals made (35) in 1993. 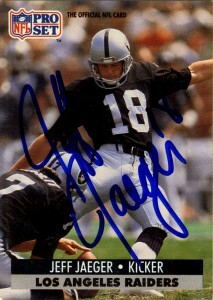 Jaeger would kick for the Raiders through their return to Oakland in 1995, and in 1996 hop to Chicago replacing venerable kicker Kevin Butler. Jeff would play there through 1999 and retire. 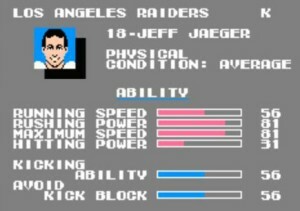 Well represented on Tecmo Super Bowl, Jeff Jaeger was an excellent kicker for the Raiders, where he’s most remembered for playing. I’d get his autograph at Cowboys training camp in 1992 when the Raiders were in town.